Kristof: 'Reserve Judgment' On 'Three Cups Of Tea' Author Mortenson : The Two-Way "Disorganization may explain more faults than dishonesty" when it comes to his friend, the New York Times columnist says. But he is "deeply troubled" by reports that just 41 percent of the money Mortenson raised in 2009 went toward building schools. There's word from CBS News that Three Cups of Tea author Greg Mortenson not only faces questions over how much of the money his charity has collected has actually been spent to build schools in Pakistan and Afghanistan, but also over whether he may owe "as much as $23 million in back taxes and penalties." 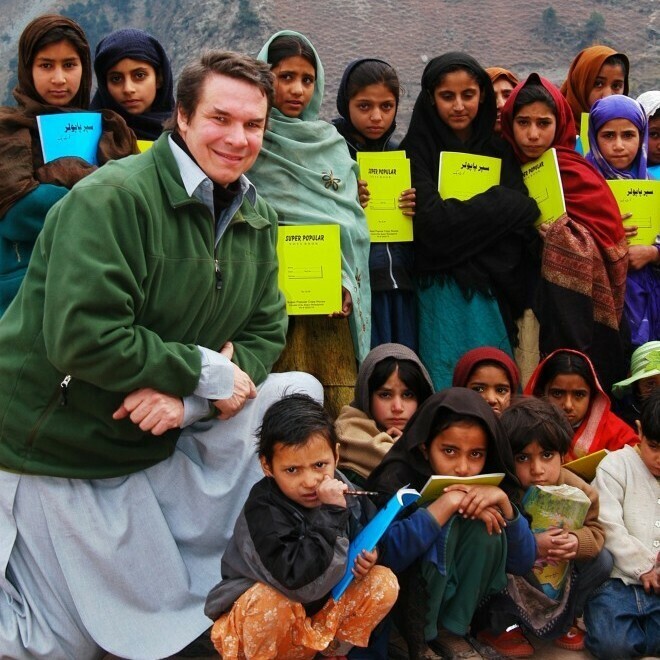 Greg Mortenson, author of Three Cups of Tea and Stone Into Schools, with schoolchildren in Azad Kashmir, Pakistan. According to CBS News' Armen Keteyian, lawyers retained by Mortenson's charity raised the tax issue in a memo. Another lawyer for the charity, however, says Mortenson "received no excess benefits" that might be subject to such taxes and penalties, Keteyian reports. Meanwhile, New York Times columnist Nicholas Kristof, who concedes he is a friend of Mortenson's, writes that "my inclination is to reserve judgment" about Mortenson "until we know more, for disorganization may explain more faults than dishonesty." "I am deeply troubled that only 41 percent of the money raised in 2009 went to build schools, and Greg, by nature, is more of a founding visionary than the disciplined C.E.O. necessary to run a $20 million-a-year charity. On the other hand, I'm willing to give some benefit of the doubt to a man who has risked his life on behalf of some of the world's most voiceless people."